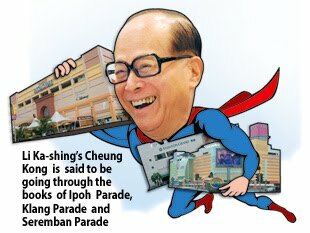 Kuala Lumpur: The Cheung Kong Group, owned by Hong Kong tycoon Li Ka-shing, has emerged as the front runner to buy three shopping complexes put up for sale by TMW Asia Property Fund. Cheung Kong, which also helps manage AmFirst REIT in Malaysia via its affiliate ARA, is said to be going through the books of Ipoh Parade in Perak, Klang Parade in Selangor and Seremban Parade in Negri Sembilan. Sources told Business Times that Cheong Kong was selected after its offer thumped those made by two other listed companies. However, it is unclear if Cheung Kong (Holdings) Ltd made the bid directly or through one of the funds affiliated to it. Li, who is also Asia's richest man, is known as "Superman" in Hong Kong due to his deal-making ability. His Cheung Kong conglomerate is one of Hong Kong's biggest property developers and owns the world's largest operator of container ports, among others. German-based TMW Asia Property Fund is selling the three shopping complexes which it bought in 2005 in a tender. The tender closed on March 8 2011. The fund is managed by Pramerica, the real estate investment management business of Prudential Inc from the US. 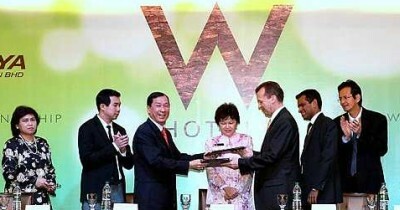 It is understood that the asking price for the three assets was set at RM500 million. International property consultant Rahim & Co was appointed as the exclusive agent to handle the tender. Real estate agent, Rahim & Co's managing director Robert Ang, when contacted by Business Times to confirm the bidders declined to comment. TMW Asia bought the properties which then belonged to the Lion Group for RM340 million. According to previous reports, Seremban Parade has a nett lettable area of 316,847 sq ft and sits on 1.97ha, Ipoh Parade has a nett lettable area of 594,414 sq ft on 4.14ha and Klang Parade has 696,045 sq ft of space. Cheung Kong's affiliate, ARA Asia Dragon Fund, bought two properties in Malaysia last year - One Mont' Kiara in Kuala Lumpur and Aeon Bandaraya Mall Melaka - for a total of RM710 million. It’s official: (From left) Rohana, Dijaya Corporation Berhad deputy managing director Dickson Tan, Dijaya Corporation group chief executive officer Tan Sri Danny Tan, Ng, Abbott, Starwood Asia Pacific development director Rajit Sukumaran and Dijaya Corporation Berhad managing director Datuk Tong Kien Onn at the signing ceremony to develop W KL. A 150-room hotel will be built in the heart of Kuala Lumpur offering guests a unique dining experience, entertainment and signature spas. PETALING JAYA: Malaysian Resources Corp Bhd plans to acquire 59 Inc Sdn Bhd for RM110mil to expand its land bank. It told Bursa Malaysia yesterday that it entered into a share sale agreement with Fadzil Ahmad, Usman Suratman and Mohd Shamir Mohd Hassan to buy 59 Inc - a company granted approval by the land office as the owner of three plots of vacant government land in Setapak measuring 27.41 acres for purposes of mixed development. The land is to be developed from 2012 over eight years into a mixed development comprising both commercial and residential properties with a gross development value of RM1.5bil and a total development cost of RM1.2bil.